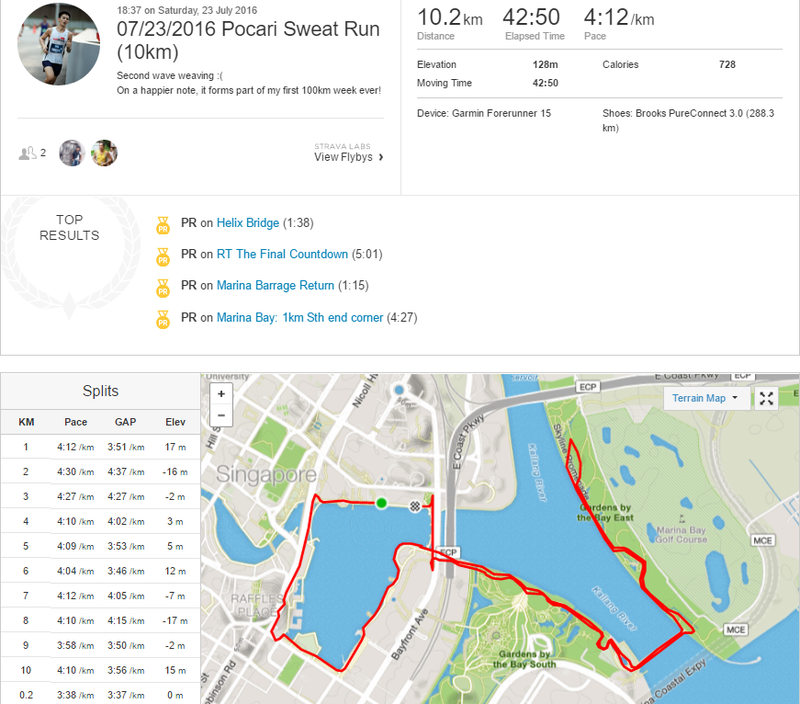 Race Review: Pocari Sweat Run 2016 [10km] (by Moses) | JustRunLah! It’s been quite awhile (relatively) since I’ve last participated in a race. This was therefore an enjoyable experience, despite a variety of aspects that could be improved. As always, I will try to provide an objective account of the the race, though you may choose to view my personal blog here 🙂 Do keep a look out for the font in italics that I feel are aspects many runners would take interest in. 10km for me! Or maybe more…? ;) Read more here. Race Entry Pack Collection (REPC) was held from the 16 to 17 July from 11am-7pm at Velocity. A pretty convenient location, yet queues were lengthy during the first day. (Note to all: minimise collection of race packs during the first few hours of the first day of any REPC if you’d like to avoid the crowd.) Race tee printing was available, though waiting times were arguably unbearable. What were the runner’s entitlements? An Asics running tee, including other goodies were included. Not forgetting a lucky draw chance to win a trip to Japan. If you were a past-participant from 2012-2015, you’d receive an exclusive Pocari Sweat jacket! Baggage deposit, restrooms and ample hydration was available at the race precinct – the Floating Platform. The location is definitely a reminder of the 24km route march to many of the younger guys that have been through Basic Military Training during their National Service. I entered the start pen just before 6.30pm and managed to start in the second wave, which was flagged off about 6mins after the first wave was flagged-off at 6.30pm. 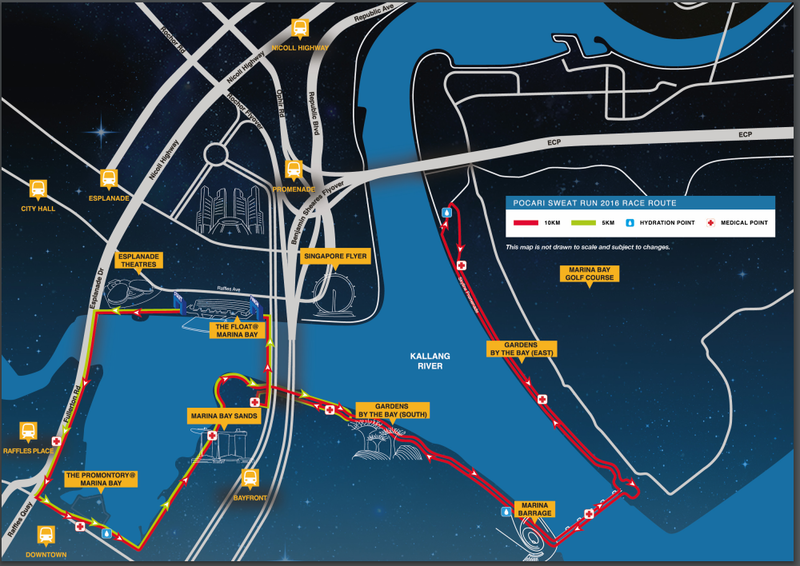 The race route of the 10km category would take participants past the Esplanade to Fullerton Road, weaving through Marina Bay Sands and looping at Gardens by the Bay (East). It would then conclude back at The Float at Marina Bay. Notable challenges would definitely be the bottlenecks and hairpin turns (no exaggerations here) at multiple occasions, such as the wooden boardwalk near Marina Bay Sands. Furthermore, holding a race through multiple tourist attractions in the evening (as opposed to typical early morning runs) meant that there were crowds that runners had to contend with. Last but not least, with runners moving in both directions on the same portion of the route, it certainly was potential hazard and contributed to the congestion of the route. The saving grace, in my opinion, was the beautiful skyline and comfortable cool weather (there was an initial light drizzle before the race commenced). The Race Route. 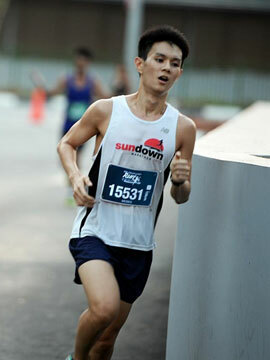 Credit to Pocari Sweat Run’s Race Booklet. The race offered hydration stations at appropriately spaced-out points. There was definitely ample Pocari Sweat available, in addition to plain water. My only qualm was that hydration was served in plastic cups (as opposed to paper cups). This meant their top ends could not be pinched together (a feature that makes drinking while running tremendously easier). Distance markers were spread out throughout the route at every kilometre. Some participants fedback that the race was longer than 10km. Personally, my Garmin FR15 did register a slightly longer route (10.2km~), though I do recognise that running through the Central Business District and under bridges/overpasses does distort the GPS signal as well. I was rewarded with an ELM Finisher’s Medal, a banana and a bottle of Pocari Sweat. There were a variety of post-race activities to engage in, such as performances and an ambassadors’ talkshow. Race results were subsequently released 3 days after the race. Cover photo credit: Pocari Sweat Run’s webpage.